You are invited to go on an Adventure! 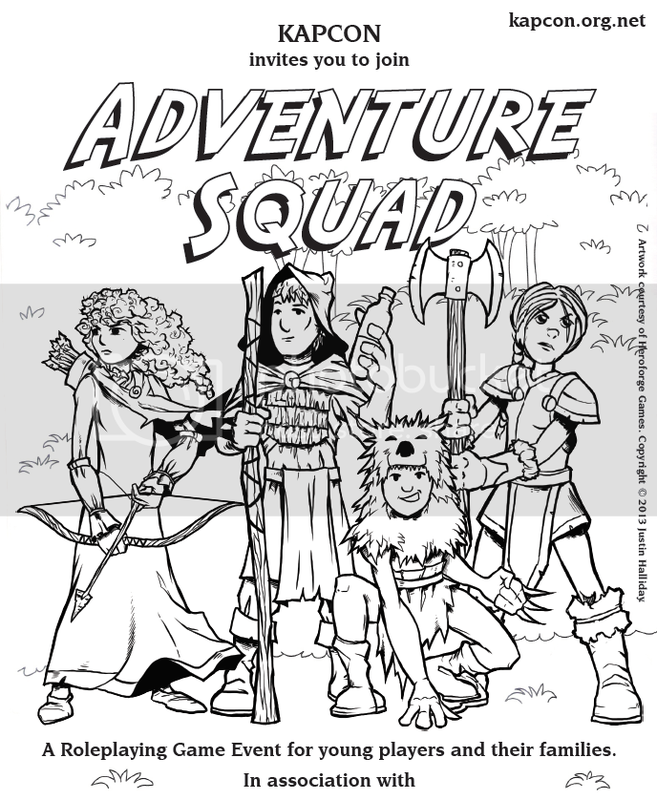 Adventure Squad is an all-ages table-top roleplaying event held by Kapcon. Games will be run at Adventure Squad for players from the ages of 5 years and up and their parents and guardians. How do I join Adventure Squad? To join Adventure Squad, both you and your parent or guardian will need to register with Kapcon and request Adventure Squad when you get to game selection. Feel free to add any other matters which your parent or guardian thinks the organisers of Adventure Squad should know about in the Comments field when registering. Please note that due to organisational requirements and limited spaces, all Adventure Squad members (parents, guardians and children) should be registered by Sunday before the event at the latest. Please note that at least one parent or guardian will be required to be present or playing in any game that you play in, unless agreed with the organisers beforehand. When and Where is Adventure Squad? Adventure Squad is held at the same venue as Kapcon on Sunday, during rounds 5 and 6 (10am to 5pm). Each round is three hours long and consists of two games between 60 to 90 minutes in length. You are welcome to go adventuring in either round 5, round 6 or both. Between games, we hope to have other activities and entertainment for you, such as board games, colouring in and storytelling games. We encourage parents and caregivers to bring along activities to run during these breaks as well. During the break between round (1pm to 2pm), you will need to find your own adventure (and lunch). What Adventures will I go on? •	You might be a mighty adventurer out to defeat monsters and find treasure. •	You may be a mermaid helping out others under the waves. •	You may be a Jedi joining the Rebel Alliance to fight the Evil Empire. •	You may be a magical animal helping other children with their problems. •	You might be a sword wielding mouse fighting for what you believe in. Once a child reaches college, they will be ready for the regular streams at Kapcon and even further adventures await. Adventure Squad is available to assist in making this transition happen as smoothly as possible. We suggest that you note the rating of the games that the player is interest in to ensure suitability and email Kapcon with any questions you have. How do I contact the Adventure Squad? How can I help Adventure Squad? Adventure Squad relies on games run by its squaddies and their parents and always appreciates offers of assistance. It is great for returning attendees to offer games (including parents assisting their children to offer games). Games run by children tend to be the most successful with their peers and encourage the other children to run. If you are a parent or caregiver who has attended Adventure Squad, we encourage you to consider running games for us too. Who else thinks Adventure Squad is a great idea?